So, what were the plucky secretaries of rye-guzzling PIs doing while their employers moped about gorgeous women and betrayal? They did the actual detective work around the office, apparently. 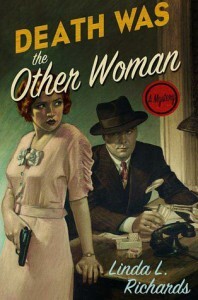 DEATH WAS THE OTHER WOMAN is a feminine take on the hard life of a struggling P. I. and his assistant during the harsh years of the beginning of the Depression before the Prohibition repeal. Both the investigator and the crime are pure throwbacks to classic hard boiled crime: a glamorous woman walks into a P.I.’s office and pays the investigator for some simple work, which inevitably leads to dead bodies and danger. What makes the story stands out is that it is told from the perspective of said investigator’s secretary, a young woman named Katherine “Kitty” Pangborn. I freely admit that I’m a snob when it comes to neo-noir and hardboiled crime. It’s not uncommon to see writers capitalize on the style without an inkling of how the dark themes of classic hard boiled crime related to the American world at large. What might be portrayal as “tough” or “cool” in another book is shown in a harsh light, especially alcoholism and the cultural despair created by the Great Depression. Huge swathes of the book are spent with Kitty’s inner thoughts on the economic devastation underlying the glamorous veneer of Los Angeles. As Kitty herself went from the ideal American heiress to a penniless working girl after the stock market crash, she adds unique commentary that isn’t often found in a genre dominated by male/middle class attitudes. The mystery itself is underwhelming. The setup is cliché as hell, and the book does little to make it stand out against the grain. Much of the detective work is buried underneath Kitty’s day-to-day social life, and there are only a handful of moments where Kitty’s ingenuity shines. Too many of the plot twists are saved for the last couple chapters, leading the book to feel unbalanced in consequence. The ending likewise feels too abrupt, as if watching a movie that ends with the second act. None of the characters are given substantial arcs, and we don’t even see any aftermath in the office after the whodunit is revealed. Whether the reader likes DEATH WAS THE OTHER WOMAN depends entirely on if the Depression Era setting of Los Angeles appeals to them. To that end, it’s a solid read. Noir buffs might get a kick out of the story, otherwise, there are better books for mystery lovers out there.